The month of April marks one year since announcing the co-op’s plan to go solar. It’s exciting to know that this important work is almost complete! This June, your co-op will begin Phase 3 of our solar installation. Cromwell Solar will install two solar-covered carports on the south side of our parking lot. Comprised of 288 solar panels mounted on steel beams, the two carports will offer 32 spaces with partial protection from the elements and shade from the hot summer sun. In addition, a solar-powered car charging station will be added for shopper’s use. The carports themselves will be constructed in phases beginning with the placement of concrete footings. The building of the steel structures, then the installation of the racks and solar panels will follow. The final phase will include electrical wiring and inspections. Find out more about our solar project at www.themerc.coop/sustainability. 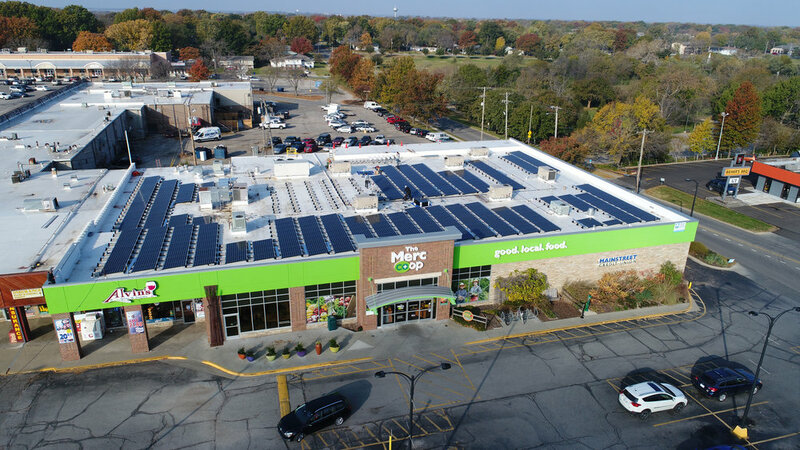 As of March 28, the 384 rooftop solar panels began generating power for approximately 17% of the co-op's energy needs. When all 688 solar panels are generating power, the co-op will generate 29% of it's total energy use from the sun.